“We walked 300/400/500 miles down Italy to the Allied lines…” is a familiar line either to those who have read the accounts by former PoWs of their walks down the spine of Italy in the autumn of 1943 to reach the Allied armies or to those who had relatives who made the long hike. Of course, no one can begin to replicate the unique circumstances of September 1943, when the Armistice resulted in the escape of thousands of Allied prisoners, but in the summer of 2017, thanks to a work sabbatical, I determined to do a month-long walk south in the Apennines of central Italy to at least experience some of the terrain they traversed. 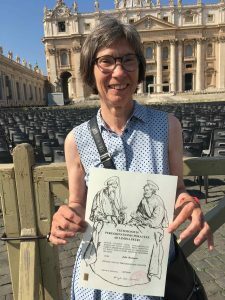 Initially, I wondered if I could follow the route of one of the PoWs but given that we do not know the specific trails they took each day, I decided to use one of the pilgrim paths to Rome and chose the Way of St Francis/Via di Roma. This goes down the eastern side of the Apennines and begins at La Verna monastery near Bibbiena in Tuscany, a place where the monks had helped passing PoWs, and overlaps with other locations that feature in the accounts. Using a travel company that booked hotels and agriturismos in the hills and moved my bags and those of the various friends who joined me for different stages, I left La Verna on 2nd September and walked via Sansepolcro, Città di Costello, Pietralunga, Gubbio, Assisi, Spoleto and Rieti to Rome, arriving there on 29th September (having had four rest days in the course of the month), a total of more than 250 miles (but less than half of what the prisoners from Fontenallato had to cover on their treks south). Our route was indicated by signs and waymarks but among the myriad questions that sprang to mind about the PoWs was how they found their way. Accounts describe how they sometimes were given a map or saw one at a priest’s house, other escapees had a compass and the memoirs mention them asking the way from farmers working in the fields – today, these people are few and far between and apart from occasional log cutters, we did not meet many farm labourers. The PoWs’ feats of navigation are impressive and the number of miles they covered each day inspiring. The hike posed other practical questions. What about water? Some of the PoWs had water bottles, and we came across occasional water spouts, but as with so many aspects of those wartime walks, you realise how tough those PoWs were. We had one morning of rain in four weeks but many of the accounts record days of rain (and snow) – and, unlike us, no guarantee of a dry bed at night. And what about the dogs that bark vociferously and announce your presence when you come close to any house or farm? We walked, talked and sang without worrying about our voices carrying or having the anxiety of coming across an Italian Fascist or a German patrol and we crossed bridges and roads with impunity. As “pilgrims” we encountered much kindness from those we met in the hills and villages, an echo of the generosity experienced by the PoWs. At Montelibretti in Lazio our hostess drove us to Borgo Santa Maria, a village built on the site of Campo PG54 (Fara in Sabina), where some of the huts used by the prison guards have been converted to houses. In January 1944, the inmates from this camp had the misfortune to be on a train on the bridge at Allerona, north of Orvieto, on their way to Germany, when it was bombed by US planes; several hundred were killed. When we drew near to the finish at St Peter’s in the Vatican I could feel the sense of urgency that happens at the end of a journey and thought of the difficulties the PoWs experienced in getting through the lines at the culmination of their walks – and the bitter disappointment of those who were caught after so many weeks of freedom in the Apennines. I now have a little more understanding of, and increased admiration for, their extraordinary achievement, for which I am extremely grateful. I highly recommend the experience.